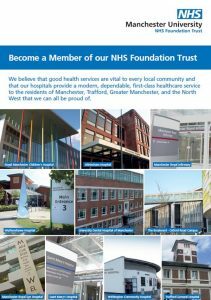 We would be delighted if you would consider being a public member of our Trust. Anyone aged 11 years or over who lives in England & Wales can become a member and it’s completely free. 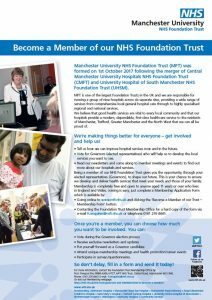 You can apply through our website – www.mft.nhs.uk – by clicking the ‘Become a Member of our Trust – Membership Form’ button or contact our Membership Office. More information about membership is on our ‘Information for Public Members’ webpage. Staff are automatically invited to become staff members – find out more about Staff Membership on our ‘Information for Staff Members’ webpage. Jayne Bessant has been successfully elected by MFT’s Council of Governors as our Lead Governor, with the election results being formally announced at their meeting held 13th November 2018. After training as a nurse at MRI, Jayne worked for over 35 years in the NHS and charitable healthcare, latterly working in senior management roles within the hospice sector, her last role being Chief Executive of St Ann’s Hospice. Jayne said: ‘The last two years have seen significant change for patients, staff and Governors. 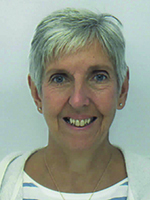 This is a crucial time with so many opportunities to further develop the work of the Governors and the positive impact they can bring.’ Jayne will serve as MFT’s Lead Governor for a 12 month period of office (ending at the Council of Governors’ Meeting scheduled for 5th November 2019). 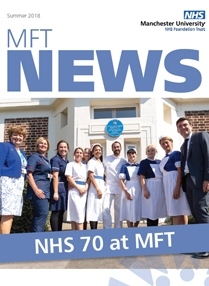 Our ‘MFT News’ membership newsletter includes an update on Governors and our Trust following the merger, alongside key patient care and research developments, a round-up of the NHS 70 celebrations and a spotlight on staff recognition.